This week I received a text from my sister that started like this: “I have someone who needs an act of kindness…” The rest of her text detailed a horrific robbery against someone she knows. For safety precautions, I’m hesitant to post specifics other than the person who was robbed is a single mom with many children and the robbery was violent, destructive, and frightening. What a helpless feeling! I knew I just HAD to do something to help, but what could I do? She didn’t need any kids’ clothes or toys, nor hot meals. What she needed was money. But what could I do? I knew my meager donation wouldn’t make a dent in recovering from this crime. I hate asking people for money and charitable contributions, but this was important. Urgent. And because this was someone my sister knew in a close way, I overcame my reluctance and posted a brief message on Facebook asking my friends and relatives for help. One friend responded immediately. “I am at Kroger. I can give you cash right now. Let me know if any other need arises & I will do whatever I can!” I literally ran up to Kroger right then and sure enough, my friend was waiting for me with cash and a hug. “I will pray for her and her family, too!” Before I could return home, more friends had sent me messages. “Horrible! I’d love to help!” one teacher responded. The next morning she handed me an envelope with her donation. 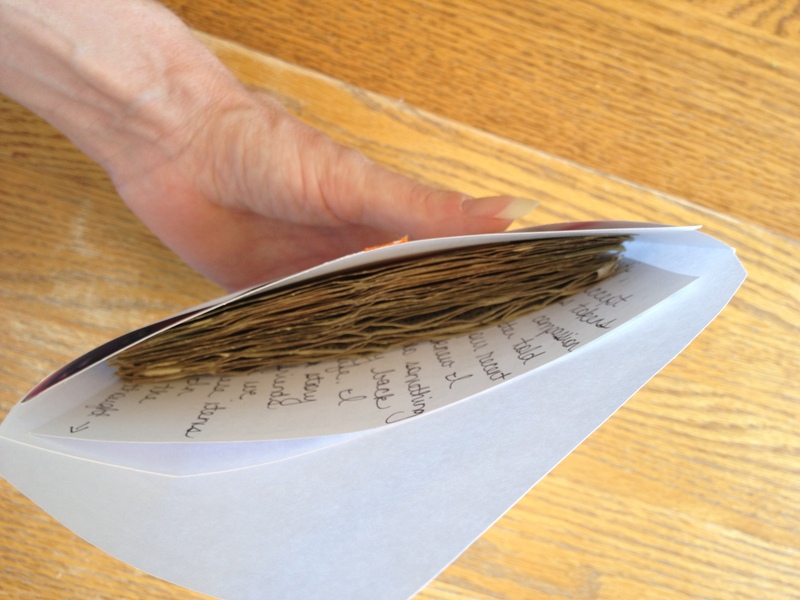 Another friend sent money to my school through a mutual friend – it was waiting for me in my mailbox with a short note stating she had scrounged up all the cash she could find in her house. The generosity of my friends brought tears to my eyes. These amazing people were not just giving a donation to charity… they were responded to a need, an outcry for help. And because they cared for me, they also cared for those whose needs I recognized. I was humbled by the sheer power of friendship and love. The donations continued. One of our relatives transferred money to our bank so we wouldn’t have to wait for a check to arrive. Another relative came to my house right after receiving her paycheck late on a Friday night. A co-worker grabbed me on the sidewalk of my school and said she was stopping by the bank to get money to donate and could she give it to me the next morning? With each donation, my excitement and love grew for this stranger. Oh, how I wished she knew how special she was! We were in awe of her story, how she was trying to make the best life she could for her children. We shared in the despair, the helplessness, the confusion, and the pain. Although we may not have experienced the horror of that night, we could empathize with the fear and worry. As I was planning out my route for making the delivery, I decided to check Facebook one more time. Lo and behold, another dear friend wanted to make a contribution, offering to drive more than 30 minutes to meet me. “Oh, I come this way all the time” she declared, brushing off the enormous generosity of time, travel, and cash. “I just want to help!” She was a classmate from high school whom I haven’t seen in years, and yet here we were, laughing and chatting as if no time had passed. 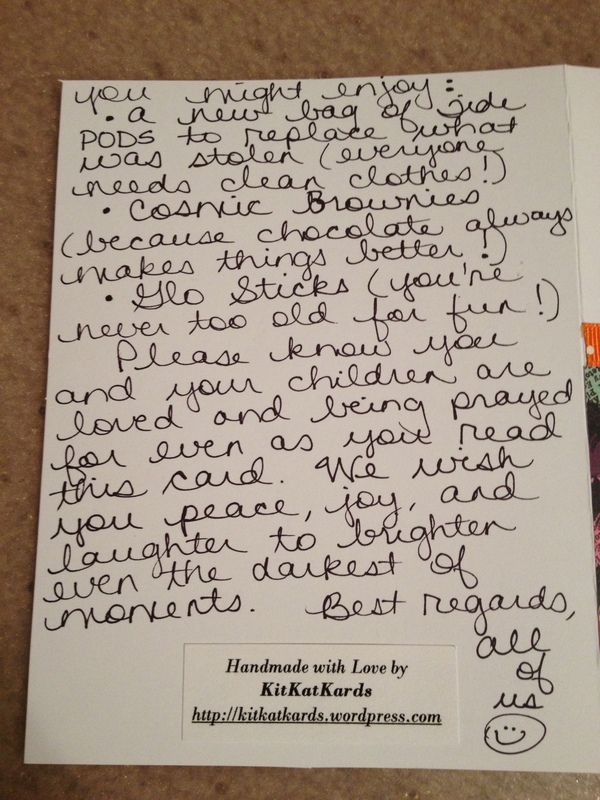 I am starting to wonder who is the person receiving the most blessings from this RAK… the robbed family or me? God is SO good! What an amazing moment of revelation for my heart! 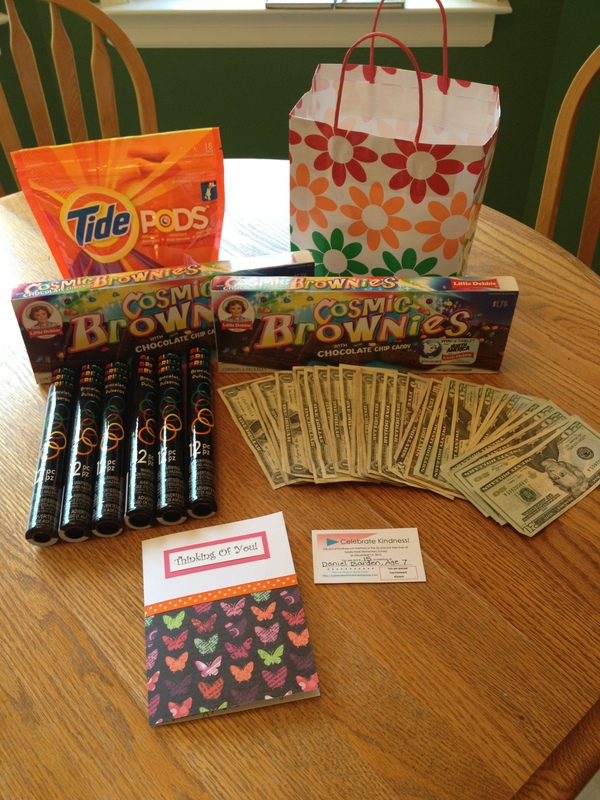 Every single donation was purposeful and when put together like clues in a mystery, the prize of blessing was revealed. Yes, I was humbled in the moment yet again. I am only a vessel being used for his purpose, as were my friends and family. This mom needed to know that even in the face of utter despair, she was loved and cared for. Always. As I put the money in the envelope and started to lick the envelope, my husband said, “Why don’t you take some money from our yard sale this morning and make it an even $300? That sounds better. She should have $300.” The mere suggestion brought me to tears, yet again. Yes! Yes! She SHOULD have $300! I quickly grabbed the money container from our early morning yard sale and quickly counted out $18 to make a total donation of $300. WOW! I found out when and where the mom was working and walked in the door, looking for her name tag. I approached her and was surprised how “normal” she appeared. I don’t know why I was expecting her to have visible scars from her experience, but she could have easily blended in a crowd, no one ever the wiser to her dismay. She greeted me with a smile as I introduced myself and how I came to hear of her story. She was speechless with surprise as I handed her the bag and I continued with a brief summary of who had helped in this act of generosity. I also explained my #26acts purpose and that this RAK was dedicated to Daniel Barden, age 7, one of the many children lost from the shooting at Sandy Hook Elementary. According to Daniel’s parents, he was “fearless in his pursuit of happiness and life”, much like this brave mom. I knew this would be a perfect RAK to dedicate to him. The mom took my bag, thanked me immensely, and our exchange was done. 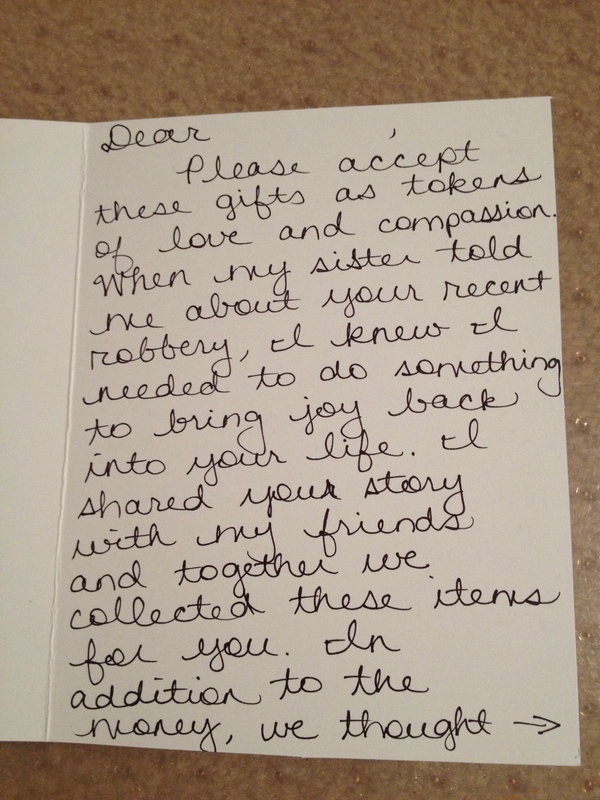 She didn’t open the card in front of me, but I am sure she was as overwhelmed by the gifts of generosity as I was. Thank you to all my friends and family who responded to my request for help. Your kindness is inspiring! I am blessed beyond measure to have you in my life!